I've lurked around this site for a while now, but now i'm at the end of my tether with sky broadband. I'm on max and i've had nothing but trouble with my connection grinding to a halt, especially on an evening. I'm having to reboot my modem 3 and 4 times in a couple of hourse surfing, and it's really doing my swede in. My noise thingy drops from about 6.8db to 4 and lower. I'm 700 metres from the exchange. I used to have the same problem, when i first got connected the first week perfect then there after dropping connection every 5mins, really got ******. I checked everything even checked cabling, filters, got a new router from sky, even tested on the main socket still had the problem. Maker sure you have done all these things, have you added anything new where you are. 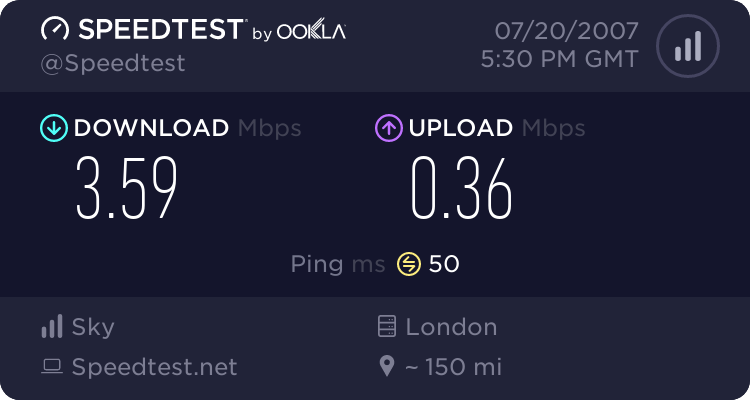 In the end i spoke to someone at Tier 3 saying i was getting high errors so he moved me from ADSL2+ to G_DMT 8mbps which is perfect no more errors and it doesnt drop at all (touch wood). Im still downloading at the same speed as before even better sometimes, i know ADSL2+ supports faster speeds but it might not be stable in some cases. Anyways check everything, test in main socket, post your stats here for someone to look at. If all fails you could consider moving to G_DMT, i find alot better even thought im only 990 meters from my exchange anything could effect my line. ^ wouldn't have your phone number on full view dude.....never know who might start pranking you!! Have you tried your test socket behind the face plate of the master socket? For us to have any idea of whats going on we would need your full stats, see the proceedure below. Click the “Get” detailed modem stats button and click “OK”. Open the file in WordPad (not notepad). tried the master socket briefly but didn't see too much difference. would have to do a longer experiment with it. Your CRC errors are high and SNR is low, I would plug into the test socket run for an evening then post the stats again, CRC errors and low SNR can cause your type of issue. ran all night via the master socket. Your line needs to be capped, end of! Had the exact same problem as you, worked fine all day but in the evenings my snr would fall below 5! By capping your line at a lower sync your snr margin will raise, so you will find in the days you have a high snr reading and in the evening it will fall but not enough to interupt your connection!